Empire Fortune slot machine is a magnificently rich game with five reels and 20 paylines, plus three progressive jackpots to seize upon. Empire Fortune software provider Yggdrasil has polished its best diamonds, rubies, and sapphires, and set them to sparkle on the reels. Read through this Empire Fortune review to see how you can get your hands on some of these sparkling stones. Play Empire Fortune for Real Money! In just a few short years, Multilotto has grown to serve more than 135 countries around the world, quickly becoming one of the leading betting services for lottery players anywhere, anytime. 20 Extra Spins on Sign Up! Up to £400 in Welcome Bonus Offers + 100 Spins! Staking claim as the world's leader in mobile iGaming, LeoVegas is considered one of first non UK-based operators to make their way to the upper echelon of online casinos in Britain. Referred to as one of the UK's premier online casinos, the Swedish-based brand is ready to continue dominating the UK slots scene for years to come! The basis of the game is simply one of sheer opulence and luxury, illustrated by the gold frame that houses the royal blue reels. 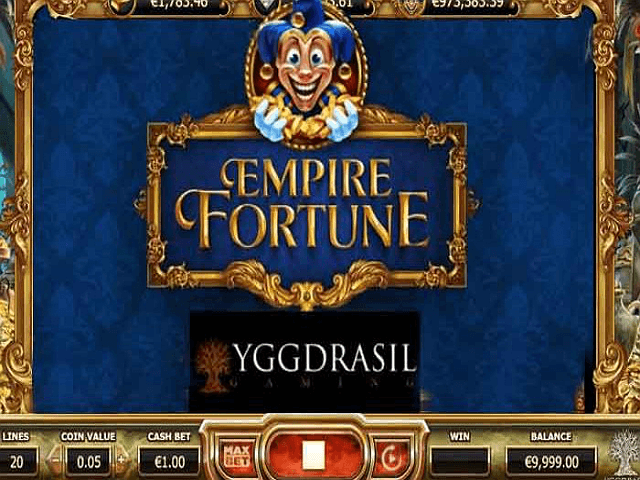 Empire Fortune has a wealth of features, including free spins and hold bonuses. 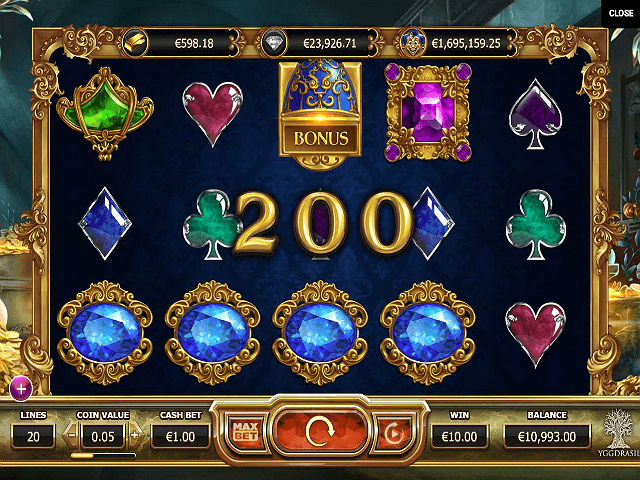 However, the main attraction beyond the polished jewellery is the trio of jackpots that players can see rising at the top of the game screen. Yggdrasil has built a reputation of making superior games with gorgeous graphics, and Empire Fortunes is no exception. Although there are no characters to speak of, the gems that spin on the reels sparkle and dazzle in the light, almost as if they’re alive inside. The light orchestral music is fanciful and fitting, with strings and harps accompanying the spins. Empire Fortune also has a sumptuous return-to-player (RTP) rate of 94.3%. Empire Fortune features the four traditional card symbols of hearts, diamonds, clubs, and spades as its lower-paying icons, with the shapes crafted to look like they’ve been cut from precious stones. The higher symbols are larger jewels of different colours, fitted into a fine golden frame. The red ruby is the highest of them all, paying out 2,500 times your bet. There are two special symbols to watch out for during play. The first is the Scatter symbol, represented by the royal court jester. 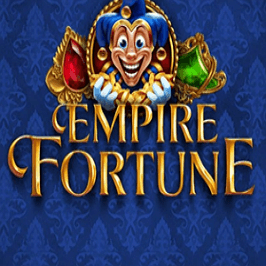 If he appears three times or more, you will win Empire Fortune free spins and a cash multiplier. Five or more Scatter symbols appearing on the reels grants you 30 free spins plus the maximum 10x multiplier. The second symbol to watch out for is the Fabergé egg-styled Bonus symbol. Landing three or more of these distinctive symbols anywhere on the reels will launch the Jackpot Wheel bonus game, with the chance of winning cash prizes, free spins, or a shot at the progressive jackpots. 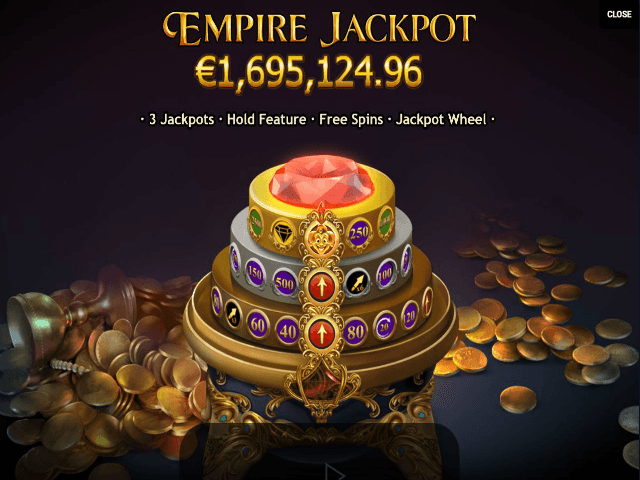 Empire Fortune offers three progressive jackpots with different pot sizes – the Empire Jackpot, the Diamond Jackpot, and the highest Golden Jackpot. These progressive jackpots are triggered during the Jackpot Wheel game, which has three tiers to play on. The level you play on depends on how many bonus symbols appear on the reels to reach the bonus round. Three will earn you a spin on the bottom level, four pushes you to the middle level, while five bonus symbols takes you to the top. During the progressive jackpot, players can climb the three levels if they land an Up Arrow on their spin, and must be on the top two levels to win one of the three pots. Landing a Joker symbol on the top level of the progressive jackpot slot wins you the Empire Jackpot. The Diamond symbol must also be struck on the top tier to win the Diamond Jackpot. 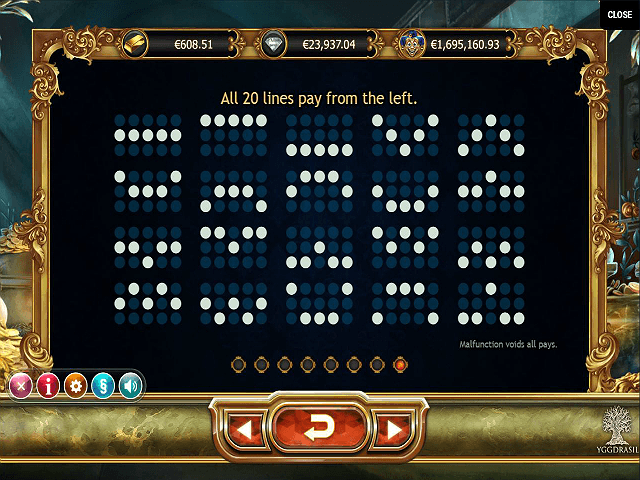 The biggest pot, the Golden Jackpot, can be claimed by finding the Gold Bar symbol on the middle level. Share this Empire Fortune Review today! If you like Empire Fortune, you'll love these slot titles too!